Catering for the certified dive market and snorkellers, Pro Dive Cairns have 3 fully equipped, purpose built multi-million dollar dive vessels - ScubaPro, ScubaPro II and the newly launched Scubapro III. This is certainly one of the very best outer reef liveaboard experiences out of Cairns. 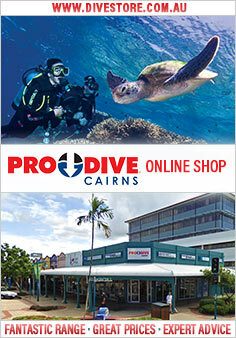 The 3 day dive adventure visits up to four easterly Outer Great Barrier Reef locations. The various sites were selected for their extravagance of marine life and excellent visibility and are rarely visited by other vessels. The trip is suited to all levels of diver training, from novice - experienced divers and gives passengers the opportunity to view magnificent hard & soft corals, giant clams, turtles, stingrays and the largest variety of tropical fish both large & small. A small difference that sets Pro Dive apart from other outer reef liveaboard vessels is that their vessels are not permanently moored on the reef and they do not use day vessels to transfer different people on and off each day. The vessel that you board on the morning of your trip is the same boat, with the same passengers & crew for the duration of your trip. The vessels carry only 32 passengers and the itinerary allows for a total of up to 11 dives, 2 of which are night dives (weather permitting). Snorkellers are certainly welcome onboard and can enjoy unlimited snorkelling. Cabins onboard are ALL TWIN SHARE. All major international scuba accreditations are accepted and snorkellers are most welcome. Flynn Reef - excellent visibility, a photographic haven. Includes Coral Gardens - magnificent coral enlivened by a myriad of marine life. Gordons - intriguing coral mazes which end at "Clown Fish City"
Weather permitting, we never dive the same dive site more than twice. From 1st April 2008 an additional fee of $45 per person, which includes a $15 Government Environmental Management Charge as well as a Fuel Levy, a Port Departure Tax and Administration costs payable at the end of the trip. Full refund up until 48 hours prior to departure. No refund if notified less than 48 hours prior to departure.